This holiday season, as you reflect on 2018, consider members of the legal community as candidates for a number of honors that the VSB, its sections, and its conferences award. Except for Family Law’s, all awards are presented at VSB’s 81st Annual Meeting in June. The Betty A. Thompson Lifetime Achievement Award recognizes and honors an individual who has made a substantial contribution to the practice and administration of family law in Virginia. And the Family Law Service Award is given to an individual or organization who has consistently given freely of time, talent, and energies to provide valuable services in advancing family, domestic relations, or juvenile law in Virginia. 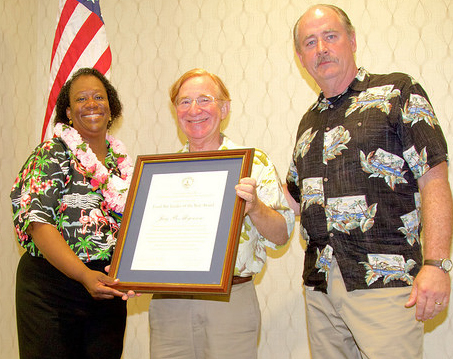 Doris Henderson Causey and Alan McGraw present Jay Myerson (center) with the Local Bar Leader of the Year Award at the 2018 Annual Meeting.